Barns are not known for their pristine conditions. And your saddle comes in contact with all kinds of different elements, from dust and hay, to sweat and cold weather. Make sure you’re taking proper care of your equipment – keep you and your horse safe and save yourself some money while you’re at it! 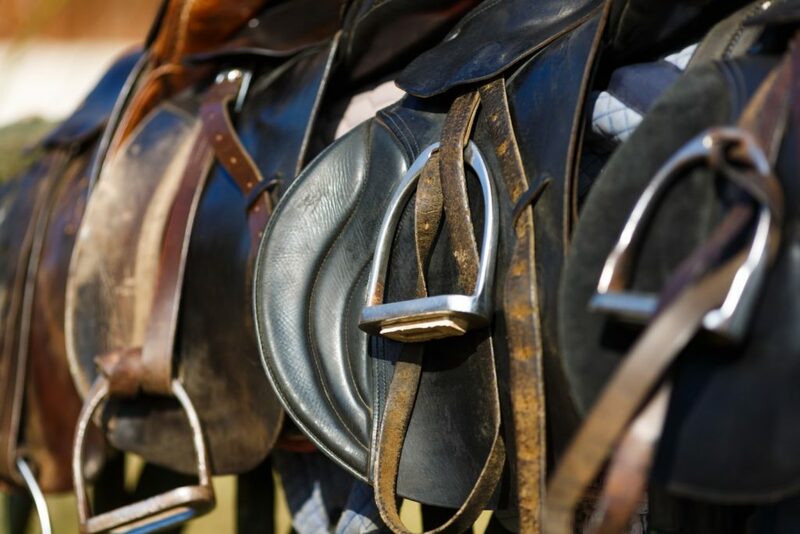 Here’s are our step-by-step guide to cleaning and conditioning your western saddles, english leather tack, and other leather equestrian products. Start with a bucket of hot water and a sponge. Make sure you wring out the sponge a bit before wiping down your saddle. The hot water helps clean the dust and dirt off the leather and opens up the pores in the leather. This will also help remove any larger pieces of debris. After wiping the saddle off, you’ll want to apply a saddle or leather soap to help clean off the dirt the water didn’t get to. Apply the saddle soap with a towel or wash rag in a circular motion. Depending on the type of cleaning leather soap you purchase, you may need to leave it on the saddle for a bit or remove it right away. Please be sure to read the instructions. Pro tip: Want to skip a step? Try using 303 Leather 3 in 1 Complete Care – you won’t need the saddle soap! 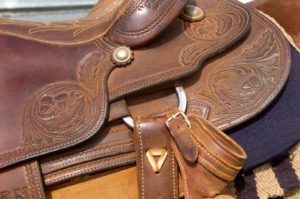 After cleaning leather saddles, you’ll want to apply a leather conditioner like TriNova’s to keep your saddle looking new and preventing damage or dry rot. Pro tip: Skip the Leather Oil – Using TriNova’s products, you won’t need to purchase or apply a leather oil. This greaseless product won’t leave behind any residue and will allow you to start riding in your saddle as soon as the product is dry, unlike most oil-based leather conditioners. Now that you have the leather all cleaned up, let’s focus on the suede. You’ll want to dampen another rag and wipe down the suede lightly. Got stains? You can use a spot cleaner to try to remove any stains from the suede. 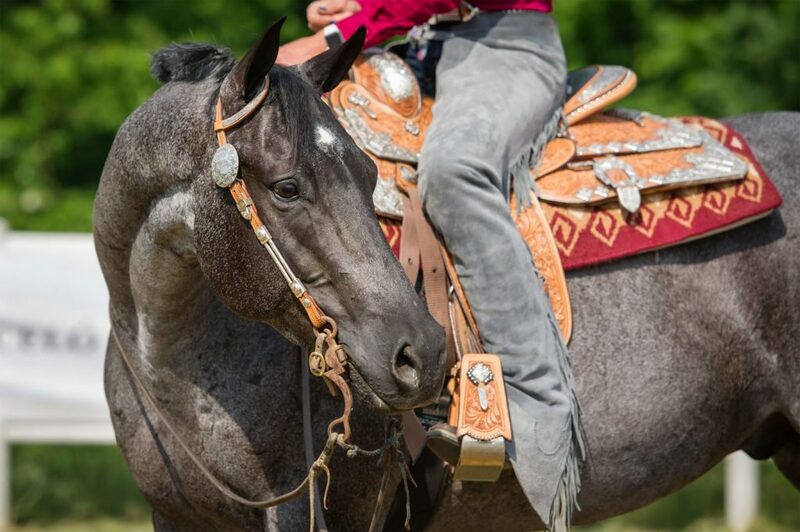 Depending on what discipline of riding you’re focused on, you may want your saddle to have that show ring shine. Cleaning off the silver and conchos on a western saddle or maintaining all of the metal billets and rings of an English saddle can be time-consuming Time Saver: Instead of spending a LOT of time once a year cleaning these metal pieces, try cleaning them more often or preventing dirt, tarnish or rust, to begin with. Depending on your product choices, you may have to wait a bit before hopping up in the saddle again. But if you go with our recommendations, you should be ready to ride in no time! Cleaning a saddle or the rest of your tack isn’t just about appearances. Making sure that everything is in its best functioning condition helps to protect you and your horse perform your best in or out of the show ring.